This week's in-depth coverage of the Colorado culture scene from CPR's arts bureau. Listen and read more online here. 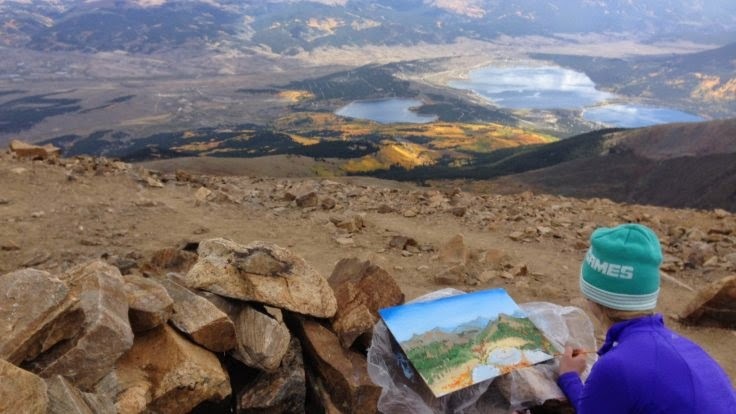 Denver artist Lisa Martin is on a mission to hike all 53 of Colorado 14ers and paint from their summits. CPR arts reporter Stephanie Wolf joined Martin on a hike up to the highest point in the state, Mount Elbert, to watch the artist at work. CPR will no longer air performances of the Colorado Symphony’s current and past seasons after a 15-year partnership ended last week. In light of the news, CPR arts reporter Corey H. Jones and digital producer Megan Arellano explore the relationships between public radio services and classical music across the country. The Western Folklife Center is launching a YouTube-based competition for aspiring young poets. CPR’s Nathaniel Minor reports on efforts to carry on the tradition of cowboy poetry. The late Eugene D. Eaton, Jr., an alumnus of the University of Colorado Boulder, bequeathed $6 million to the school, its largest gift in years. CPR arts reporter Corey H. Jones speaks with the College of Music dean Robert Shay about how the music department intends to use its share of the funds. The Denver Museum of Nature and Science celebrates the 30th anniversary of when it first displayed artwork by the late 20th-century Russian sculptor Vasily Konovalenko. CPR contributor Lee Strubinger reports on the priceless collection of gem carvings. The Denver Performing Arts Complex brought more than $141 million to the city and county of Denver in 2013, according to a new analysis. CPR arts reporter Stephanie Wolf reports on how the city plans to use the findings to inform the reimagining process for the downtown complex. Arts happenings around Colorado this weekend: CPR’s Arts Bureau spotlights this weekend’s Colorado cultural events, including a Denver photographer's homage to a Colfax Avenue watering hole, an array of holiday-themed events and more. Coverage from CPR's arts bureau is now also available as a weekly podcast via iTunes and the NPR podcast directory.